Most avid craft lovers have one thing in common: tons of crafting stuff and not enough space to put it all. If your craft room is a mess of spilt buttons, tangled ribbons, unraveled thread, wrinkled fabrics, dried glue, and glitter glistening on every crevice, don’t fear. You’re not the only one. 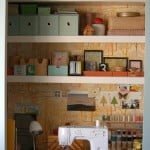 And because of this ever-so-common crafting problem, we’ve compiled a list of tips to keep your crafting room or space as organized as possible. The main tip is to utilize every possible storage space. If you’re limited with craft space try hanging baskets from the ceiling. For inexpensive drawers, find some clear plastic drawer sets at a local store and use the drawers to keep materials out of the way, but still easily in sight. When utilizing space, try to build vertically by placing shelves along all the available wall space. for your space. Look for one that provides lots of storage and work space, but also feels comfortable, and fits well within the room. If the craft desk doesn’t have enough storage, you could always place a small filing cabinet beneath the desk. Place a bulletin board over your craft desk so you have a place to tack up papers, tutorials, inspirational photos, and other instructions you may need while crafting. Keep the tools you use the most close at hand. Have a special basket designated to scissors, glue and other tools that will always be in easy reach of your work space. You can also create a tool rack by mounting a piece of wood to the wall and then securing hooks to the wood to hang your most used tools for easy accessibility. Organize fabrics and other materials in boxes that are clearly labeled so you can find specific fabrics with ease. Have a box for pastel materials, prints, bold colors, etc. Keep ribbons, cords and threads on rods that can be attached to the wall, or tucked away in a closet. This will keep them organized and not in a tangled mess. Finally, make sure to spend a few minutes at the end of every craft session tidying up your area so it stays neat and organized. 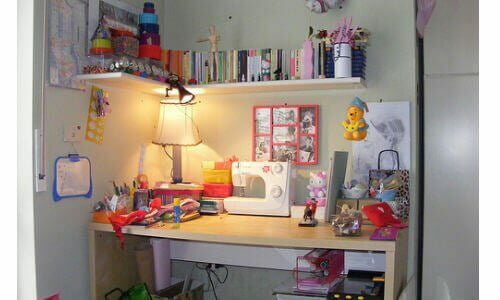 After implementing these tips you should be well on your way to an organized craft room. Now it’s time to get creative!